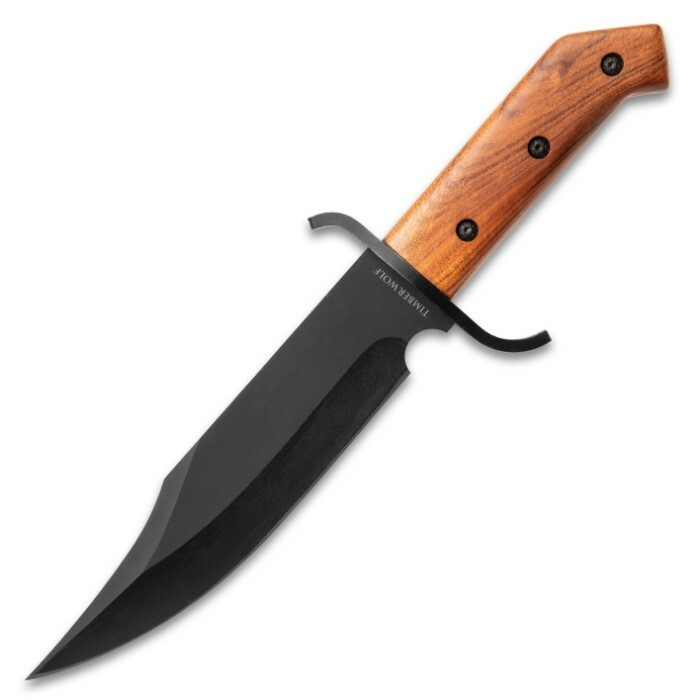 Timber Wolf ClaimStaker Bowie Knife And Sheath - 3Cr13 Stainless Steel Black Blade, Full-Tang, Wooden Handle - Length 12 1/2” | BUDK.com - Knives & Swords At The Lowest Prices! 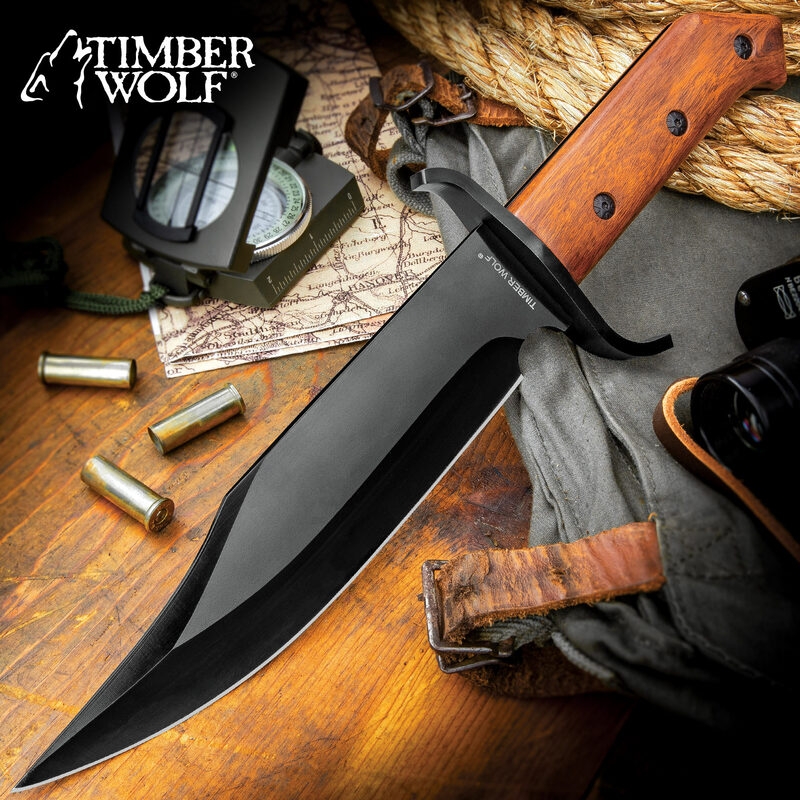 The rough and tumble Timber Wolf ClaimStaker Bowie Knife is built for hard use in the harshest of environments. This solid and hefty knife has a keenly sharp, full-tang 7 3/4” 3Cr13 stainless steel clip point blade with a black, non-reflective finish and choil. The light brown wooden handle scales are attached to the tang with strong screws and the hefty guard is black metal. 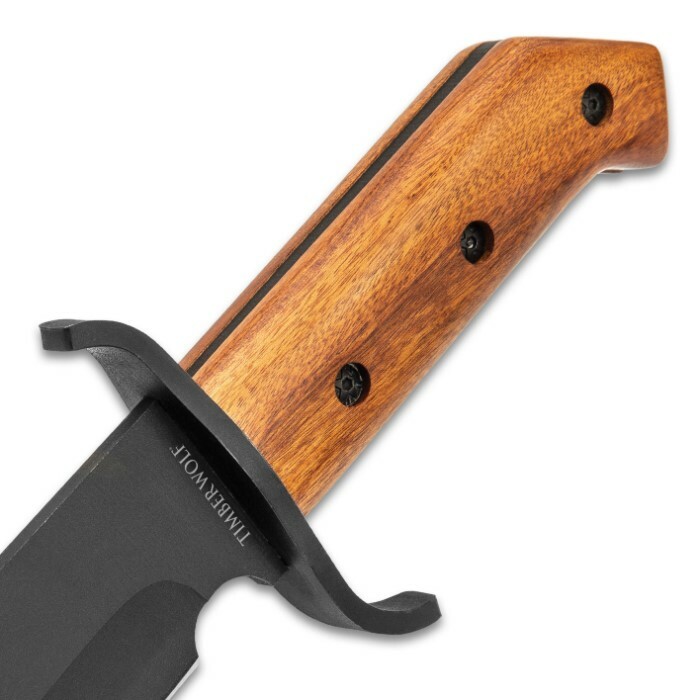 The 12 1/2” overall bowie knife slides securely into a tough, nylon belt sheath with a Velcro closure handle strap. I absolutely love this knife. It’s a big hefty knife that is as solid as solid can be. Comes with a sharp blade and a nice thick wooden handle. The full tang blade assures you, you’ll have no problem out on the field or any task at home. The sheath is the only disappointment not because it is poorly made but because it’s a nylon sheath rather than a good leather one. Other than that, this knife is up high in my collection. I will continue the 5 STAR rating string for the TW Claim Staker Bowie, ONLY thing I changed was the Sheath, to a heavy duty leather one found on Ebay. Very satisfied with the knife & look forward to YEARS of use. 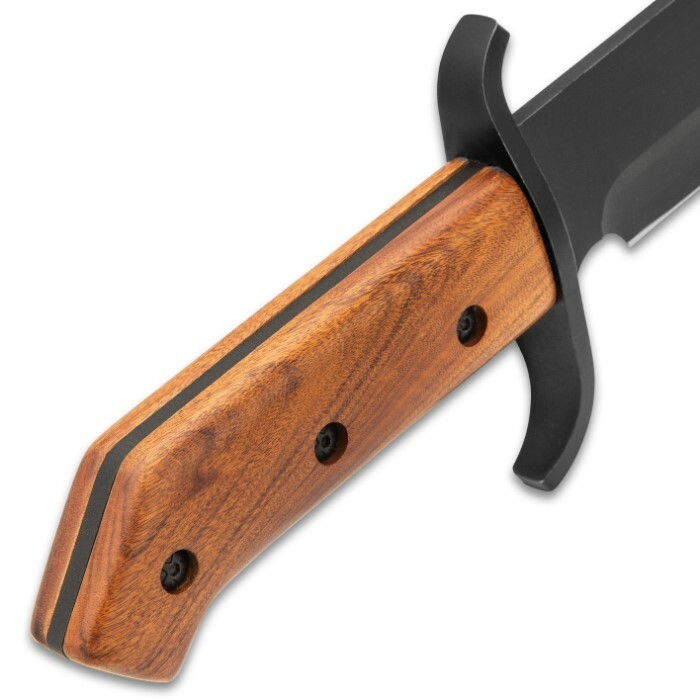 I was looking for a good knife to break down for a project I'm doing, (using some found camp wood to turn into heirloom camp tools for my kids when they get older), and could just not find a knife or blank I liked. I settled on this knife for 20 bucks and glad I did. Not just a good knife but truly one of the best I own. When my KaBar is not at my side this will be. One quick note the handle is a bit wide for my taste, not a big deal as I had planned to replace the scales as previously stated but something to consider if you are not a fan of thick handled blades. This fine Timber Wolf Claim Staker Bowie is a very nice knife, the blade is a classic bowie design, the blade comes very sharp out of the box and is a good strong knife. 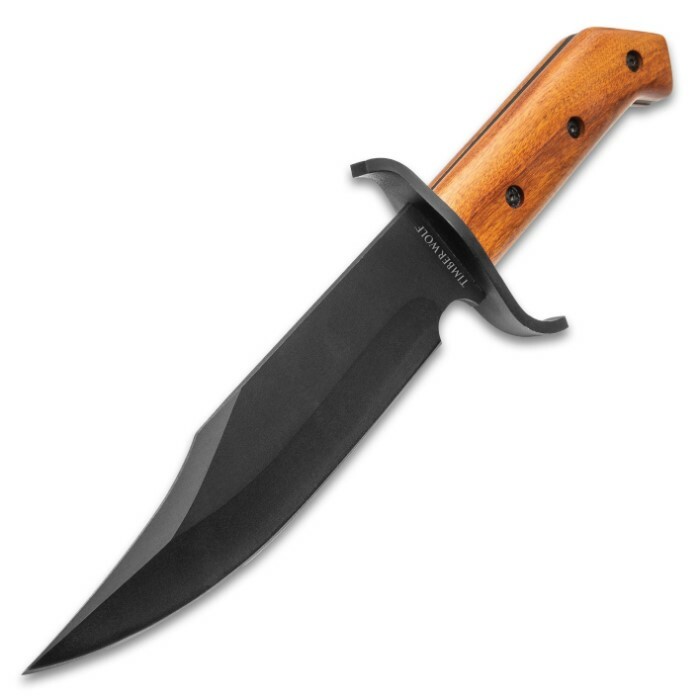 What I love about this knife is that it is a small replica of the, Cold Steel 1917 Frontier Bowie, a great knife in it's self, They look great displayed together. 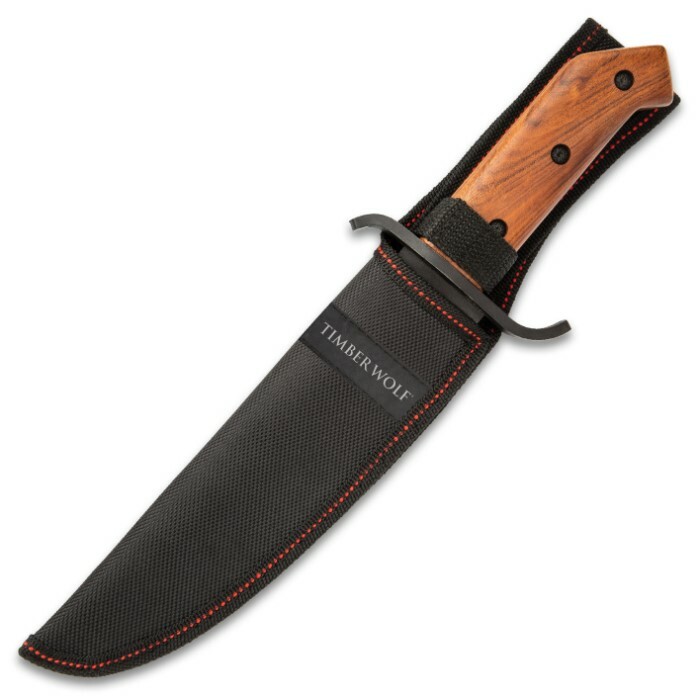 This Timber Wolf Bowie is an excellent knife and I recommend it to everyone that loves camping, hunting, and fishing. Thank you.